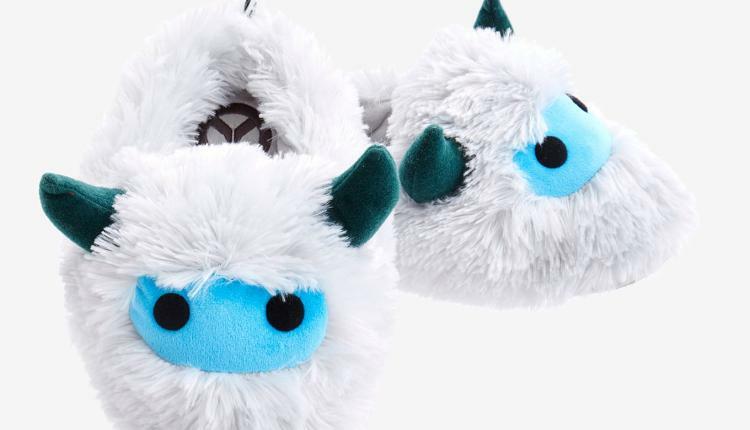 Mei Yeti Slippers Available Now | Nerd Much? In need of new house slippers? Look no further than these Overwatch Mei Slippers. They are fluffy, soft, and positively adorable – there is no reason to say no. Whether you are a Mei-main or feel in love with her character in the Overwatch comics, you are sure to find these slippers perfect. The Overwatch Mei Yeti Slippers are 100% polyester and sport two little greenhorns each and a little blue yeti face with black eyes. Inside the heel of the slippers is the Overwatch logo. As white as freshly fallen snow, they will get dirty fast. As such, I highly recommend that you avoid putting them in the washer or dryer. The washer is a bit safer, but it is not recommended to do this often. Instead, you should be washing these with a damp cloth. However, if you happen to step into something nasty with these slippers on, a full wash might be in order – just do not put them in the dryer or they will never be fluffy again. The sizes these slippers come in are not perfectly clear, as there is no gender mentioned. As thrilling as this might be for non-binary folk, manufacturing companies have not gotten the memo yet. As such, it might be best to assume they are men’s sizes and purchase accordingly. Unless for some reason, they think only women would buy Mei slippers, but who knows. If you are worried about the sizing, Box Lunch has fairly decent return and exchange policies, if you do not mind paying for shipping. Nonetheless, these Mei Yeti Slippers are too adorable and soft to pass up. Show your Mei pride as a new hero comes on the scene by the name of Brigitte. She is the daughter of the famous weapons-maker, Torbjörn. Instead of weapons, Brigitte specializes in armor and defense, though that does not mean her Rocket Flail packs less of a punch. Watch out for that swing and put up an ice wall before she can get to you.